If you have a garden with growing rhubarb, chances are you end up with too much of it. There’s only so much juice you can make! I have bookmarked rhubarb soda and wine recipes and even bought the equipment, but haven’t had time to make any of it yet. So I just wash, chop and freeze my rhubarb in 200 g freezer bags until I know what to do with it. This cake is my go to recipe when I need to free up my freezer in colder months. Very comforting, not too sweet, a bit sour, soft and chewy at the bottom and crunchy on top – perfect. Perfect cake for excess of rhubarb in the garden. 150 g unsalted butter, melted. Skip the salt if using salted butter. 200 g brown sugar. 150 works well too for less sweetness. Place rhubarb pieces In a small saucepan together with sugar and spices (if using). Cover with water and bring to the boil. Place all crumble ingredients in a food processor and pulse a couple of times until it resemble crumbles. You can also do this by hand. Chill in the fridge. Preheat oven to 175 C. Butter and line a 9" round spring form pan. In a standing mixer with a whisk attached, beat together eggs, yogurt, butter and vanilla. Change the whisk to paddle attachment. Add the rest of the ingredients and mix until smooth. Poor batter in prepared tin and bake for 20 minutes. Meanwhile, drain the rhubarb. 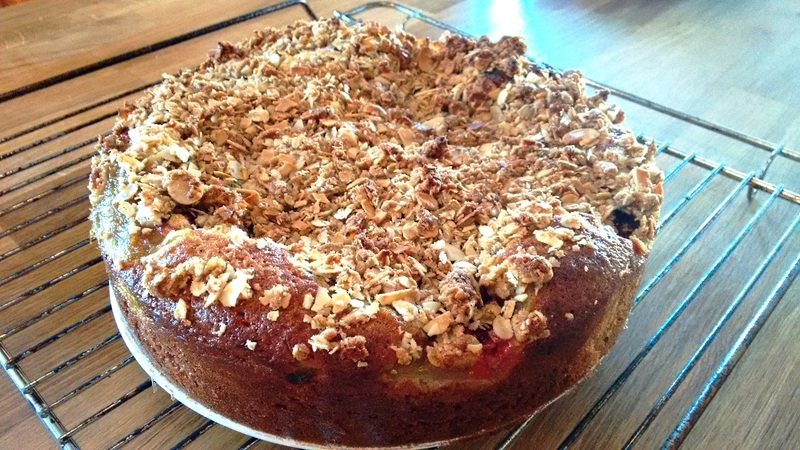 Remove the cake from the oven, it should be almost done by now, and arrange an even layer of rhubarb on top. Then arrange an even layer of the almond crumble on top. Return cake to the oven and bake for another 20. Cool on a rack before unmoulding. *fresh rhubarb will stay intact, but frozen will fall apart. This will not affect the taste, just the texture of the cake. Mmm, denne så god ut!? Den må jeg prøve. Jeg også har fryseren full av monster-rabarbra, fra forrige sommer(!). 2017-avlingen endte dessverre i komposten fordi jeg ikke hadde plass til mer i fryseren. Jeg synes det er vanskelig å finne gode oppskrifter uten et tonn med overraffinert sukker. Vi har brukt denne oppskriften mye: https://www.beritnordstrand.no/rabarbra-crumble/ Viljar(10) elsker den, men Ylva(6) synes den blir litt i sureste laget. Jeg synes den er aldeles deilig, søt, salt og syrlig. Vi spiser den slik den er, uten verken is, krem eller yoghurt. Absolutt å anbefale. Hilse til den kjekke husbonden din! Hei! Takk for oppskriften, jeg skal prove det. Fryseren min er fortsatt full av rabarbra. Jeg prøvd å lage rabarbra lacto-fermented soda, men det var en katastrofe 😀 Jeg kan prøve med vannlig gjær en dag. Hilse til familie din også.